This is the third in a series about author visibility. First I discussed some challenges indies face. 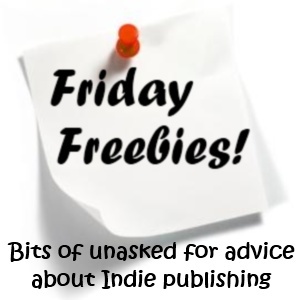 Last week I discussed some beneficial and some not-so-beneficial ways to use freebies. This week I want to consider the value (or not) of free. Everybody loves freebies. We try them because there’s no risk involved. We’re not out anything if we’re disappointed. So it makes sense that authors would want to use this natural draw to gain new readers. Think about it. How many of us have found our favorite books and authors this way? Did you purchase your first book by a favorite author? Or did you check it out at the library or borrow it from a friend? But there are two schools of thought on this, and I’ll admit, both have valid points. Probably the most famous advocate for giving work away free is the English author Neil Gaiman. In fact, he’s the one who drew that analogy to library books. Then he pointed out that most of us who found a favorite book or author for free then went on to purchase additional books by that author. Very true. I’ve done that. In a video I’ve seen on several blogs now, Mr. Gaiman tells how he grew alarmed when his work was being heavily pirated. Then he noticed he was selling more books in those areas than anywhere else! Freebies, he came to realize, are actually excellent advertising. He then encouraged his publisher to release his book, American Gods, for free for a month. As a result, sales of his other books went up 300 percent the following month. Last fall I read an article by another biggie author who now releases all his digital content for free. All of it! I know this is horrible, horrible journalism, because I can’t remember the fellow’s name, and I have totally failed to track down that article again. The link is buried somewhere on the BookBlogs forum, but in it the author mentioned how he’s making a killing off his paperbacks. And there are many who argue that making work free is actually detrimental. The market is over-saturated. Free isn’t appreciated. Free cheapens your work. Free cheapens everyone’s work. Free too often means a poorly written, unedited book. Free is dragging down the establishment. Free negatively affects authors who must charge for their work. Free is lowering the standard across the entire industry. Okay, so I do have to agree with some of that. Hmmm. There are certainly a lot of opinions on this topic, and I’m really curious to hear what yours are. I tend to fall in the middle of the extremes. I have no intention of giving away all my work, and I don’t download many freebies because the quality is usually substandard, but I still think giving away some work can be useful. If you tuned in last week, you’re still waiting for that last suggestion I promised–that great brainchild, my new strategy. Sorry! You’ll hear it in my fourth and final post in this series which will appear here the first Friday in September. Next week I’ll be guest posting a blog tour wrap-up on one of my favorite blogs. So tell me, what are your thoughts on free? Is it beneficial to a new, unknown author? Or does it contribute to a declining quality of literature? That’s what I’m talking about, Erik! 🙂 Or I buy a different book by that author.